Welcome to Throw Back Thursday! Today I want to share with you our Master Bathroom remodeling project we completed a while back. If you want to add value to your home, a sure fire way is to update your master suite! About a year and a half ago my husband and I completed our master bathroom remodeling project. It took about a year from start to finish because we did much of the work ourselves plus served as general contractors for the entire project. Trust me, you can save a ton of money if you approach a renovation this way. The photo on the left shows the original builder grade bathroom. After a few years it really started showing its age and we knew it was time to upgrade. The picture on the right is a sneak peak at the transformation! We began the demolition with the glass shower and the plastic floor pan. The glass doors came off easily but the tile and floor pan were cemented into place. This part of the demo took a few long weekends and lots of back breaking work. If you are able to tackle the demolition portion yourself, you can save a ton of money. Why pay for skilled labor to do demo work if you don’t need to? Then you are able to hire out the more technical parts of the project such as the plumbing and electrical work. The ugly plastic soaker tub was next to come out. This monster took up half of the bathroom and we never used it. It was also cemented to the floor. Ugh. The entire tub was surrounded by tile. We removed every inch of tile from the shower, tub surround and the floor. It was not a pretty sight. And the tile was really heavy to remove! We finally decided on a color and had the wall patched and painted. We used Revere Pewter for the walls and it matched the gray tiles much better. 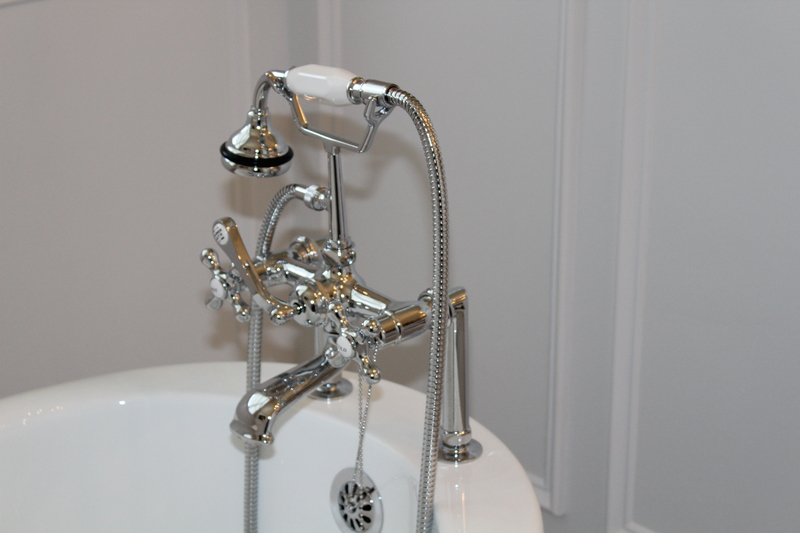 And we love the new claw foot tub and oversize shower! We used polished chrome accents throughout. I guess I should actually take a bath in this tub before we move! After installing a new white quartz counter top, new sinks and hardware, the master bathroom is finally complete! It all came together nicely in the end. This is how the chandelier looked when I purchased it for $50. I found it at one of my favorite consignment stores. It had such a pretty shape, but the bronze color and the amber beads didn’t do it any favors. Even Lacey thought it needed a little TLC. And the “after” picture above. I spray painted the chandelier with titanium silver and switched out the amber crystals and beads with clear glass. (I used the old crystals as my guide.) So much better! This light fixture will remain with the house and I’m fine with that. I got to enjoy it for a few years and now someone else can enjoy it! We added a picture of The Lady of Shallot to the wall opposite the tub as the one piece of art. Well, I think our hard work was well worth the effort. Gone forever is the outdated and sad looking builder grade master bath. It’s replaced with a fresh and clean look that is neutral and classic enough to suit most any style. Not only did we get to enjoy it for a while, but I think it helped sell the house! We got an offer on the house just four days after it went on the market. I can’t wait for another house to decorate! !